Hello everyone, Olivia here. Today I want to tell you about a Rescue that for me, is kind of special. The face of our Knotty Toys logo is of Chelsea, who was a Bull Terrier. Adora-Bull Rescue & Rehabilitation is a non profit based in the city of Vereeniging, which is in South Africa. 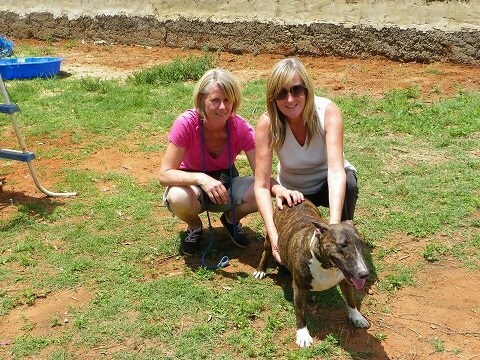 Their focus is on Bull Terrier’s, who in South Africa, have an unearned reputation as a dangerous breed. As a result, many end up as strays. You can visit them on Facebook too. Remember, a dog is a dog, there are no “dangerous breeds”. End BSL everywhere! We are huge fans of rescues, but particularly those who focus on training & finding homes for bully breeds. Breed specific legislation is one of my biggest pet-peeves. Undeservedly too many pits & bullies have been stigmatized by poor ownership (just like Rotties, Dobermans, German Shepherds in years past). It’s impawtant for rescue groups like Adora-Bull to not only rescue but to also education as many people as possible so that people understand what great dogs these guys can be, just like any other.